Every year since 2010, some of New York’s most prestigious architectural designers, through an inventive project called Architects for Animals, have been helping New York City’s feral cats by creating imaginative winter shelters to provide them with a refuge from the cold. 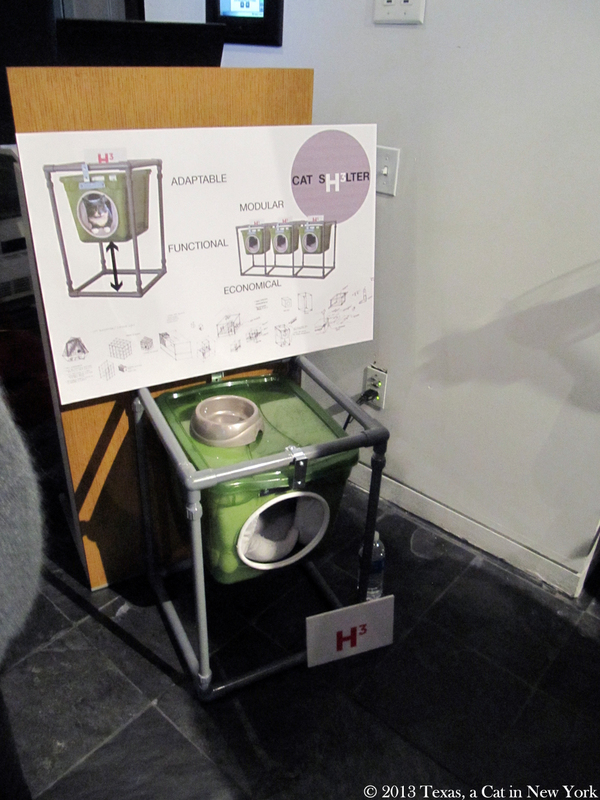 We are delighted to present these collections of unique, inspired winter shelters for public viewing at the Architects for Animals: Giving Shelter exhibit before they are placed in locations throughout the city to provide comfort for the cats. This annual exhibition benefits the New York City Feral Cat Initiative of the Mayor’s Alliance for NYC’s Animals. It was taking place in the place called Manhattan, very close to Columbus Circle. I would like to start by thanking Sparkle for posting so quickly about the event (that’s how we learned, and we live in NY! ), and Tamar of I Have Cat for sending the info to bloggers. Thankfully, a lot of people showed up; the showroom was crowded. So of course, my human didn’t even offer to bring me to the event. Okay, there was a LOT of people, but she could have offered still. My human took the pictures during the event, so the pictures tend to be crowded too. You can see good shots of each shelter at Cat Wisdom 101 and I Have Cat. But here are my human’s. Leslie Farrell, founder of Architects for Animals, made a short speech to thank everyone. She got a little emotional. She invited everyone to pick some kibbles at the buffet to put in their favorite shelter’s bowl, in order to vote. Yes, furriends, despite my human pretending there would be only human food at the buffet, there were kitty kibbles! The first one is by M. Moser Associates. You can click on the third picture to read more about these kitty pods. See the bowl on the floor? That’s in those that people could vote by throwing kibbles in there. The following one, Swiss Cheese by Stonehill & Taylor, was entirely made of recycled materials. 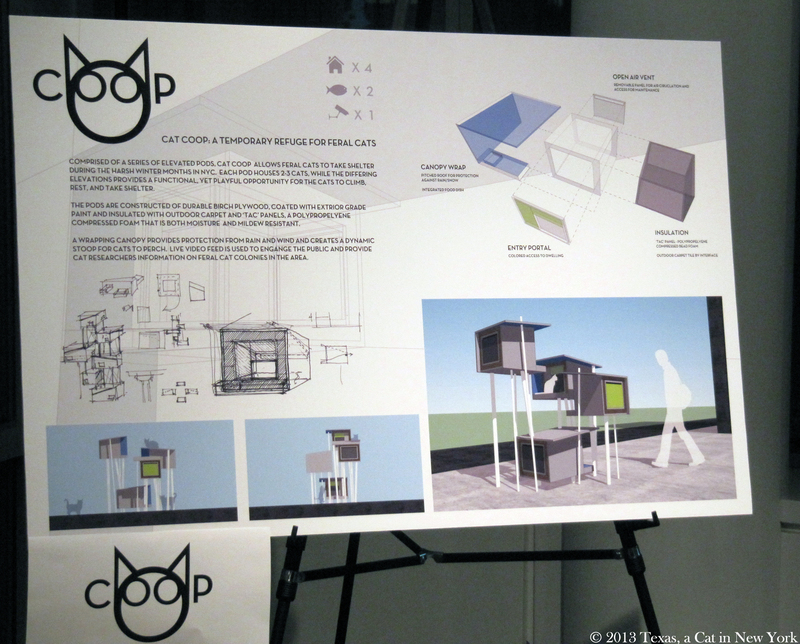 The next one is a simple, one cat shelter, by H3 Hardy Collaboration Architecture. You can click on this one. Since this is NYC, it’s only fair that kitties have their skyscraper (okay kinda) too. This one is by Francis Cauffman. The last one my human took pictures of (apparently, she missed one) is quite original. It is made with recycled cat food cans (yes, cat food cans!) that are insulated. The shelter is made so that 2 to 4 cats can be inside it at the same time, but still not be too close to one another (I am not sure it is very visible on the third picture, but the inside kind of has corners). It was made by the American Street Cat. This shelter is aready being used (check here). 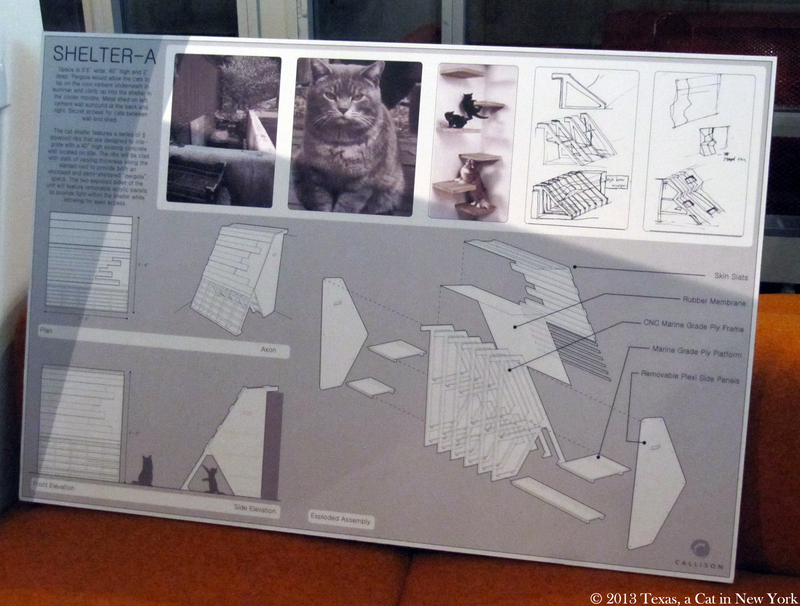 Last but not least, this DIY NYC Cat Fort, by Pilot Projects. Isn’t that cool?! You can find the details here. My human was glad to see Tamar of I Have Cat and Layla of Cat Wisdom 101, that she had both met at the Rentaneko projection. She was also very glad to meet Kevin and Tracey of Animal Shelter Volunteer Life. I wish I could have meet them too! All in all, my human says the event appeared to be successful. Let’s hope it will be able to do its part to help NYC feral kitties. You can find more pictures here, as well as “in progress photos of a habitat for NYC’s homeless animals,” Stonehill & Taylor’s shelter, on Stonehill & Taylor’s Facebook page. I can definitely play with it! A little less than a month ago, I pawticipated in my first ever Twitter pawty. It was organized by Baby Patches of Nip and Bones and the beautiful Sparkle. It was a virtual book signing pawty for Sparkle’s book! I was very excited and liked every minute of it. 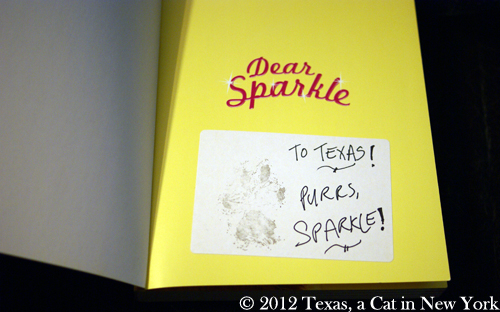 The beautiful Sparkle answered questions and pawtographed books like a pro. Of course, being a kitty, she is a pro! 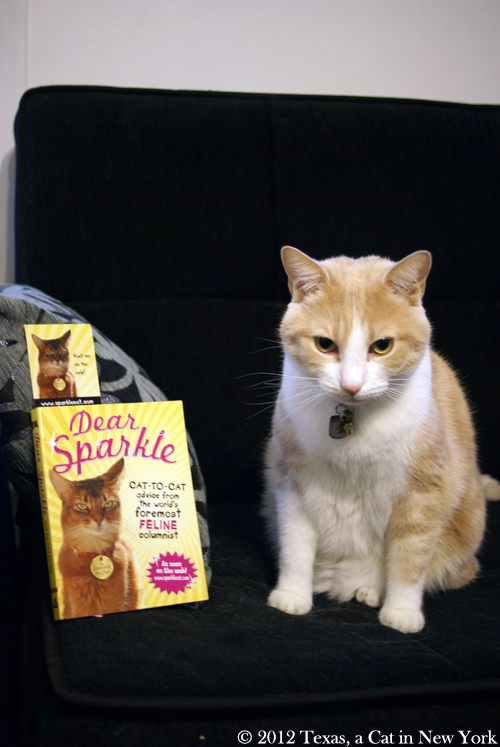 “Dear Sparkle: Cat-to-Cat Advice from the World’s Foremost Feline Columnist” is a must-have for any feline, my furriends, and for many reasons. The book is full of colored pictures of the beautiful Sparkle, and this only is a reason to own it. But the book is so much more. Sparkle has collected letters from kitties from around the world that sent her their questions about kitty issues that you and I may well have encountered: from toys and games to dealing with strange human habits to litter box issues. Sparkle answers with wits, humor and charm (is there anything more charming than a Ladycat with repartie?). I liked that the book was divided into sections related to different kinds of issues. I also absolutely loved the little “Sparkle Says” tidbits of wisdom here and there. The book reads well and you can either read it from cover to cover, or pick and choose a letter and Sparkle’s answer. Even if you don’t have the issue mentioned in the letter, there is always something to learn from the expert. What better expert can you ask for as a kitty than a kitty? This book has been written by a kitty and you can clearly see it. Open-minded humans will read this book and take it as a way to better understand their master kitty friend. Conclusion: we give it four paws! I mentioned above that I answered a question to win the book. It was about her next book, and it is going to be about cat rules for humans. I am eagerly waiting for this book and Kitshka and I have started applying rule #882, as you can see below (we were on the human’s hubby’s chair). THANK YOU Sparkle, for this great book! We’re a little late reblogging this but some of you might have missed it (like we did initially). So check these wonderful paintings of Japanese Cats at Myau Myau’s photo gallery. Cat lovers had better to go to watch Ukiyoe cats images exhibition at Ukiyoe Ota memorial Museum of Art at Harajyuku, if you stay in Tokyo. It will finish on July 26th (THU) 2012. These cats are wearing kimonos, dancing, playing Kabuki, eating, drinking, frightening people, taking a bath, wedding and so on. They are splendid works for Kuniyoshi school members at Edo period. Minette’s Feast: a book about a cat and food in Paris. What’s not to like about it? Remember I mentioned this book before? Well, my human borrowed it at the library some time ago and we had the occasion to read it together. No, I was not snoozing! Well, it’s a lovely little book. My human even plans to buy it when she can to keep it. It is primarily a children book, so it is a quick read for a cat or adult human. It is full of beautiful drawings of Minette, Julia Child‘s Parisian cat. It tells the story of how Julia Child, then studying cooking in Paris, came to adopt Minette and what Minette’s life was like living in Paris with Julia Child. Both my human and I liked it lots. Me because it’s mostly about a Parisian cat and my human because it’s about a cook and beautiful drawings of her cat. Also, as mentioned before, this makes a great book to introduce cats and cooking to a child. All in all, go check it out. You can see part of it on Amazon (to give you an avant-goût). Also you can see images here and here. Rentaneko… neko neko… Who wants to rent a cat? So our humans left us alone, Milou and I, Wednesday evening. To go to the movies!! Can you believe that? Well, the truth is I understand why they did: they had the opportunity to see Rentaneko or Rent-a-Cat. What is so unfair is that us kitties couldn’t go. 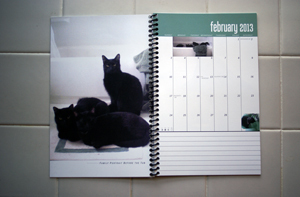 Rent-a-Cat is about a young woman running a business of renting cats to lonely people. The rented cat’s mission, she explains to her clients, is to mend the hole in their hearts. But Sayoko, the young woman, is also yearning to find her special someone. I am a bit jealous because I would have loved to have been able to see the movie. My human liked it very much, as did her husband, and she said she will buy the DVD if it is released. So we can watch it all together. But when? Also, my human had the occasion to meet two nice ladies from two of my favorite blogs (after all, that is thanks to me if she found out about this movie! ): Ms. Tamar from I Have Cat, who posted about the movie, and Ms. Layla from Cat Wisdom 101, who reviewed the movie. I also wish I could have met these two cat lovers and my human said they were very nice ladies and they all had a good time! Sooooo while we wait for a DVD, err, we’re going to take a nap. Go watch this movie if you can! The humans say it is worth it and for once I’m inclined (vocab builder) to believe them! Oh, also my dumb human realized why these were called neko flies… We do deserve to dominate the world, don’t you think?